So far, through four outings, it would be tough to argue with Nylander. The former eighth overall pick has been showcasing his slick skill and looking more comfortable each game beside center Evan Rodrigues and Conor Sheary. In Sunday afternoon’s 4-3 shootout win, the Swede played his best NHL contest, registering two assists. 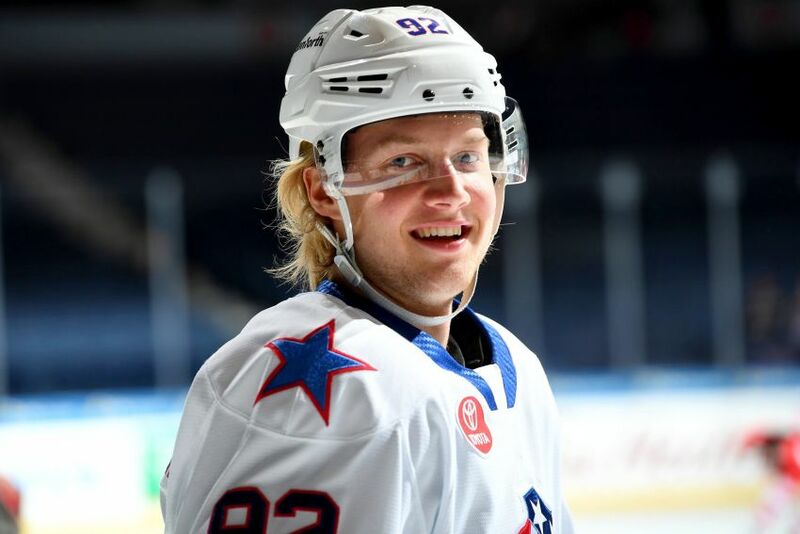 The Sabres, of course, promoted Nylander, 21, from the Rochester Americans late in each of his first two AHL seasons. This year, however, the enigmatic prospect appears to finally be seizing his chance. “He’s taking advantage of the opportunity,” Sabres coach Phil Housley said. “Each and every game he’s seems to get better. His linemates are helping him out, they play a fast game. He’s just getting more confident down low, in the corner. He’s driving on cycles, he’s making plays up ice and he’s using his speed. While Nylander will likely return to the AHL for the playoffs, he might’ve played his last regular-season game. He could force the Sabres to keep him. Nylander should face his brother, Toronto Maple Leafs forward William Nylander, on Wednesday in Buffalo. Check back later for more on the brothers and the Leafs, who have beaten the Sabres four straight meetings for the first time since 1971-72. In other news, Sabres forward prospect Matej Pekar, 19, has been assigned to the Amerks from the Ontario Hockey League’s Barrie Colts. Pekar, a fourth-round pick in 2018, 94th overall, hasn’t played since breaking his collarbone Jan. 10. The Colts’ season recently ended. The Czech, whose agitating style stood out during development camp, might spend his time in Rochester practicing. Pekar scored 14 goals and 36 points in 33 games in his first junior campaign. Housley should stabilize his lines so they can get to know their linemates basic strengths and weaknesses and adjust their play accordingly ! Too many manipulations of line personnel leads to the aforementioned inconsistency we are witnessing ! at most in nhl you are paired with one other person consistently. Players move around all the time. your obsession with set lines is a very dated concept. Alex has size and skill to succeed in the NHL. Unfortunately, he plays like a marshmallow on skates and avoids contact like the plague. I would love to see him flourish at the next level as his development is also critical to the success of the Sabres. Until he is able to put some sandpaper into his game I will remain a skeptic. Totally agree and as the 8th overall pick he better be producing both goals and assists at a high level. Should be a top 3 forward as the 8th overall or at least a top 6 on a really good team. I don’t see him replacing Skinner, Eichel or Reinhart on the top line so he needs to be a dominate player on the second line. He needs to up his game on the physical part as well as offensively. You say he has been going into the corners and playing physical and that I should pay attention? I have been watching him for the past 3 years. You may be right. I may have missed the play you are referring to.